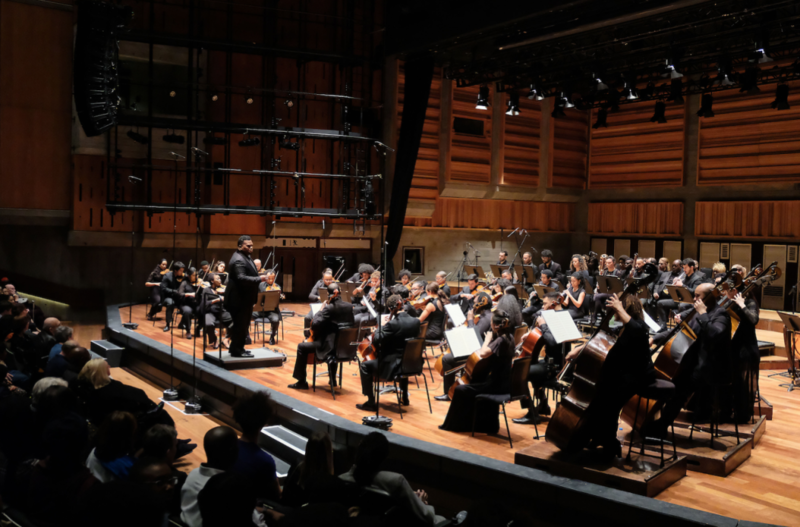 Following over two years’ extensive redesign and refurbishment, the Queen Elizabeth Hall and Purcell Room were reopened on Monday 9 April with a concert by the Chineke! Orchestra and an exhibition that surveys the history of one of London’s most iconic music venues. Chineke! was founded in 2015 as Europe’s first majority Black and Minority Ethnic professional orchestra and has led the way in the drive towards increased diversity within classical music. On the 50th anniversary of Martin Luther King’s burial, the concert staged the world premiere of Daniel Kidane’s Dream Song. Commissioned by Chineke!, this work sets words from King’s speech (sung by baritone Roderick Williams), ‘I have a dream’. The concert was opened by The Building of the House, Benjamin Britten’s celebratory concert overture from 1967 to mark the reopening of the Snape Maltings near Aldeburgh. The reopened QEH will soon play host once more to pianists from across the globe. On 19 April, Nicolas Hodges gives a performance of Stockhausen’s 50s masterpiece KONTAKTE with the percussionist Colin Currie, plus the UK premiere of Birtwistle’s Intrada for the same piano-and-percussion combination. A week later, the venue’s International Piano Series reopens with a recital by Benjamin Grosvenor, playing Bach, Brahms, Berg and Brett Dean (26 April). Further recitals in the series include appearances by Khatia Buniatishvili (9 May), Pierre-Laurent Aimard (playing the complete Ligeti Etudes as part of a Ligeti in Wonderland weekend festival) and Paul Lewis, continuing his series of Haydn, Beethoven and Brahms (5 June). Next door at the smaller Purcell Room, the Concrete Dreams exhibition takes Southbank audiences through the history of the three venues (including the Hayward Gallery) which were designed in the late 1950s to complement the magnificently severe lines of Sir Denys Lasdun’s National Theatre on one side and the Royal Festival Hall designed by Robert Matthew and Leslie Martin and built to mark the 1951 Festival of Britain. Programme books from over half a century of concerts mark significant events in the history of the QEH and Purcell Room, including concerts given by Itzhak Perlman, the London Sinfonietta and David Bowie. Open until 29 April, the exhibition culminates in a performance weekend (27-29 April) of poetry, classical Indian music and contemporary dance.